This weekend, while adventuring with young Tozz, Tiddly was invited to go to the Obsidian Sanctum with 24 other adventurers to attempt to kill Sartharion with one of his drakes still alive. After one quick wipe due to some people still not understanding the lava wall and void zones, we quickly reformed, and took him out. Our group then semi-disbanded, but those left decided to go play around in Mount Hyjal. We quickly worked our way to the end, had some problems with a few bad apples deciding to pull the boss when we weren't ready, and then took out Archimonde with ease. 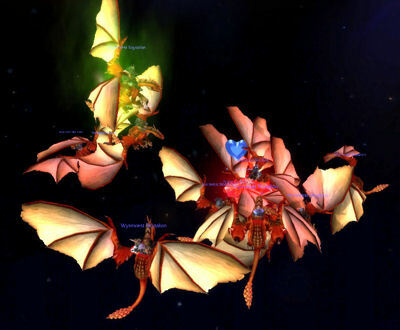 And then last night, after our first few attempts last Monday, we went back to try to bring down Malygos. After a couple of attempts as our death knights perfected their spark grabbing, and a few more wipes due to Malygos glitching right before the vortex (we put hunter pets away and had no issues - seems the bug is back), we took Malygos down after two more attempts. In our first attempt, during the third phase, I was not targeted at all by Malygos and successfully stacked 22 or 23 flame engulfs, but we had too many down to take him out before he enraged. On our next try, we knew we had him where we wanted him. We stacked the sparks perfectly, we took the scions out quickly, and we had over four minutes of the third phase to work him down. Unfortunately, Malygos remembered me this time around and constantly targeted me so I was unable to get past 10 stacks on him. But I survived quite a few until he hit me as I had just added to the stacks and had no energy to work with. 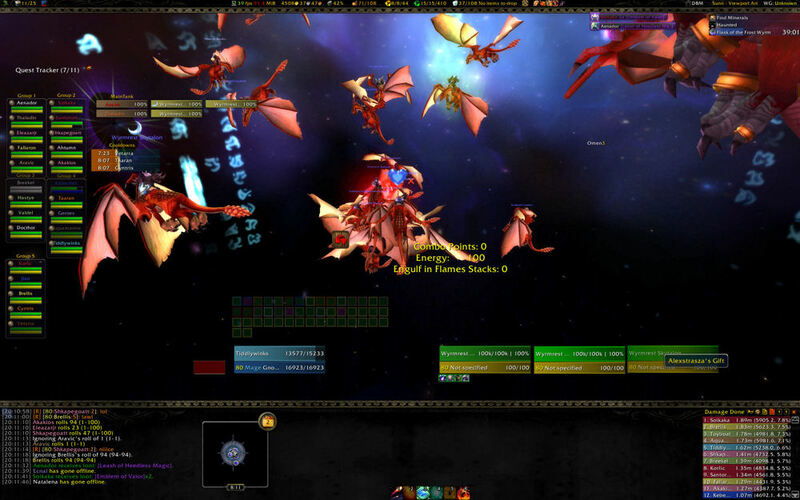 My new UI builds on the UI I had a while ago prior to Wrath. Fubar lines the top with relevant information, my raid is down the left side which always allows a quick view of our status during a fight and I have tanks and cooldowns right there next to the raid. In the upper-right, I have XLoot and Elkano's Buff Bars and Omen3 (clear) in the middle on the right side. Above the main black area in the middle, I am using Pitbull for my unit frames (they still need a little customizing), Decursive is above my name and there's more targeting and pet bars over on the right side. I'm still working on it all and will try and get a better shot during a normal battle. Oh yeah, you've got MalygosCP right there in the middle - an amazing mod. Always gives me a very quick view of Combo Poitns, Energy and Engulf in Flames stacks. If only it could blink if you were targeted or something. On the bottom panel we have (left to right): chat, map, bartender bars (hidden due to the fact I'm on a "vehicle"), and recount. Other recent achievements, Heroic: Construct Quarter (last Friday - along with 50 emblems of valor), a Heroic: Twilight Assist on Saturday along with Hyjal, and then of course, last night (not pictured): Heroic: The Spellweaver's Downfall. I now sit at 495 achievements. Wonder what will be #500?